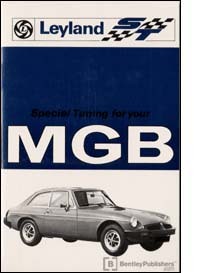 The MGB as delivered from the Factory in its standard form is tuned to give performance consistent with complete reliability, and in compliance with various territorial regulations. There is, however, a demand from enthusiasts all over the world for information on methods of improving the performance for competitive and road purposes, and it is to meet this demand that this booklet has been prepared. It must be clearly understood, however, that, whereas it is a simple matter to increase the power output of the engine, this increase in power must inevitably carry with it a tendency to reduce reliability. It is for this reason that the terms of the Owners Service Statement on a new MG expressly exclude any supertuning of the kind described in this booklet, but this does not mean that tuning in this way will necessarily make the car hopelessly unreliable. In fact, it may be assumed that it will be at least as reliable as other cars of similar performance. This booklet is laid out to give details for progressively increasing the power. With the above ideas firmly in mind, you should select the simplest tuning method which will give the performance required. Tuning hints are included for racing enthusiasts who want to go to the limit and who have facilities to modify or make up special parts for their cars. We hope this section will be of use to them.